A sought after national and international speaker, Donna Jones has spoken in twenty states and on four continents, keynoting events of more than 1000. 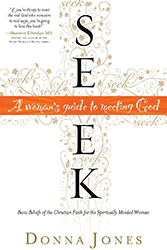 She’s the author Seek: A Woman’s Guide to Meeting God, Raising Kids with Good Manners, and Taming Your Family Zoo, and is a contributing author to the 365-day devotional, A Moment to Breathe. Donna’s been featured in Parents and Better Homes and Gardens magazines and writes regularly for Crosswalk.com. She has been on numerous radio and television shows, including Focus on the Family and Good Day Dallas. A graduate of UCLA, with a degree in Communications, Donna’s spoken for nationally recognized ministries like Proverbs 31 and Hearts at Home and is a member of Advanced Speakers and Writers Association. Deeply involved in her home church (she and her pastor/hubby planted Crossline Church in 2005) Donna teaches 200 of her best friends in Bible study each week. At home you’ll find her sipping a really good cup of coffee, at the gym (yes, she’s one of those people), or struggling to keep her garage clean enough to park in. Her favorite role, though, is wife to her college sweetheart, JP, and mom to their three wildly funny young adult kids, who frequently sit on her kitchen counter just to chat.